When it comes to garage door repair in the greater Lawrenceville area, HABPRO Garage Door has cornered the market. As industry experts, HABPRO Garage Door understands exactly what customers need when their garage door or garage door opener breaks down. We are a locally owned and operated company that has served commercial and residential clients for nearly 40 years. While our deep knowledge and skill in the industry is unrivaled, we are most known for our superior customer service. HABPRO Garage Door has earned numerous awards over the years for our attention to customer satisfaction, and we are proudly considered “Atlanta’s Best Choice” in garage door repairs. HABPRO is a full-service garage door company that specializes in the repair, replacement and installation of garage doors. We’ve established a trusted relationship with top brand manufacturers, including C.H.I., Clopay, Wayne-Dalton, Liftmaster, Genie and many more. While our products are top ranked in quality, you can also trust that our technicians are licensed and skilled to perform reliable repairs when you need it most. There are many types of garage door repairs, and HABPRO Garage Door is equipped to handle them all. We do our best to provide one-trip service to save you time and convenience when repairing your garage door. Whether your garage door is suddenly refusing to open or your torsion spring is slowly showing signs of wear, we can help you with the professional and honest repairs you deserve. Our technicians respond quickly and show up with a truck stocked with late model replacement parts so that your garage door can be restored to optimal working condition as soon as possible. When it comes to garage door repairs, we do a thorough job. Our 15-point checklist ensures we aren’t missing any weak or malfunctioning component of your garage door system before we leave. Our company is committed to helping customers protect and extend the lifespan of their garage door at all times. You can expect a long-term solution and no-hassle service from start to finish. 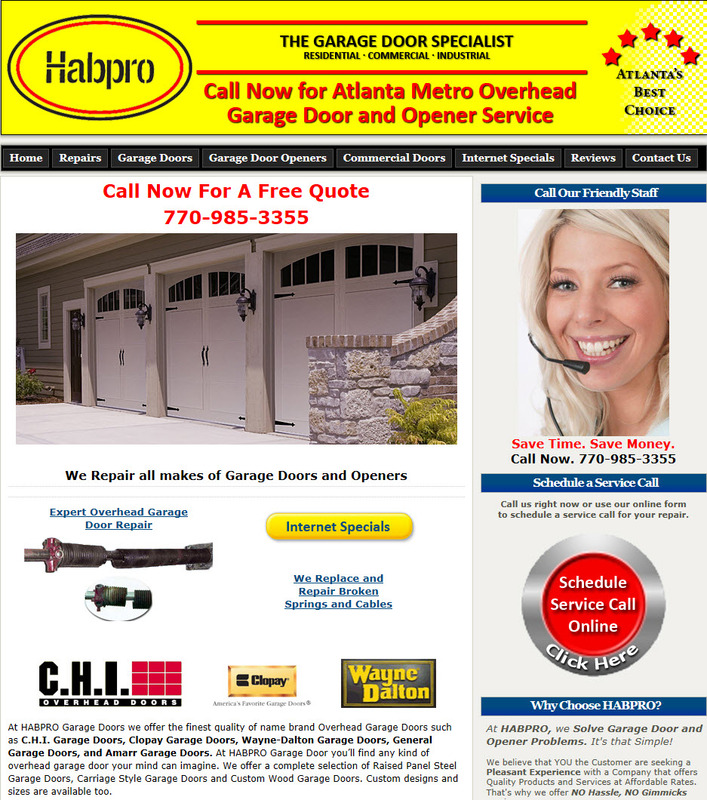 If you need garage door repairs from a reputable Atlanta based contractor, call HABPRO Garage Door today. Because we want our customers to feel comfortable doing business with us, we welcome your questions and concerns at all times.